In the 1890s, E. H. Guyer promoted a new city linking Rock Island and Moline that he called Keystone. Although that dream city of 60,000, complete with its own court house, city hall, post office, depot, and theater never developed, the area did grow, as did the neighborhood school, now known as Longfellow. The first school in what is now called the Keystone neighborhood was built near 7th Avenue and 42nd Street in 1880. It was a small building, said to have only four rooms. A decade later when a larger school was needed, the school board retained architect Edward S. Hammatt as its designer. Hammatt, who maintained offices in both Rock Island and Moline, received his education at MIT and Lehigh University and worked with well-known New York City architects prior to coming to this area. The colored postcard, from Richard Iverson’s collection, shows Hammatt’s design for Public School No. 7 as it appeared in the early 1900s from a vantage point near 41st Street. 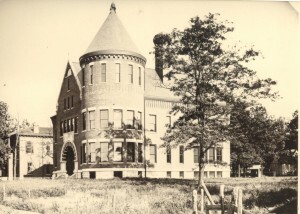 A circa 1893 photo from the same angle shows what appears to be the original school in the left background. The site of the first school had been donated in 1880 by William E. Brooks, developer of several adjacent subdivisions, on the condition that the land never be used for other than school purposes. When it came time to build the postcard school, more land was needed so the west 145 feet of the block was purchased from Brooks heirs for $2500. Contractor C. J. Schreiner completed P.S. No. 7 in 1891 at a cost reported to be $19,700. Hammatt’s public buildings brought the richness of Richardsonian Romanesque architecture to Rock Island and this school was no exception. The huge entrance arch and the parapetted gable are defining characteristics of that style, as is the unusual corbelled brick trim at the top of the walls and as the high stone foundation. 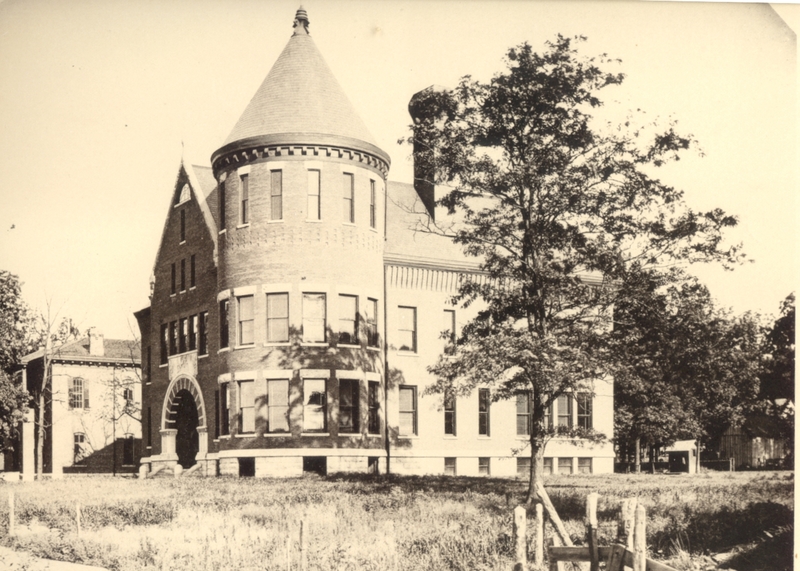 The brick school was basically rectangular with a striking large round tower topped by a “witch’s hat” roof on the northwest corner. It appears strong as a fortress, a safe place for parents to send their children. Yet it was a very bright fortress–the tower alone contained 18 double-hung windows. In 1897, the name was changed to honor Henry Wadsworth Longfellow. 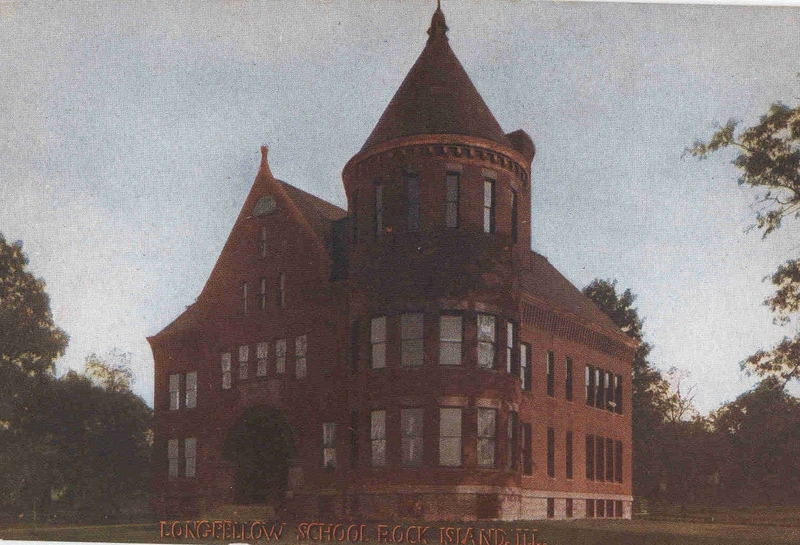 At that time all Rock Island grammar schools were named in honor of “deceased men of letters.” One of the students took it upon himself to write a letter to Longfellow’s daughter (the great poet had died in 1882) to tell her about the school’s choice of name. She replied to him in a letter that was read at the renaming ceremony. Reports of the era claim that Longfellow has “one of the finest school lots in the Tri-Cities”. Moreover, “located as it is in one of the better residence districts of the city, the school has enrolled a class of pupils who are naturally intelligent and of quick perception.” Talk about setting high standards! The Keystone “residence district” continued to grow as did the number of nearby children attending school. In 1911, architect O. Z. Cervin designed an addition that was constructed by Collins Bros. The addition at the back of the original school enlarged the original 7-room school to contain 13 classrooms as well as space for domestic science, manual training, a gymnasium and a principal’s office. By 1912, enrollment here was 216 boys and 194 girls in a building that was large enough to accommodate 100 more. Then, disaster. Early on a Monday morning, February 12, 1934, a fire that began in attic wiring in the old part of the building caused $60,000 damage. Only quick work by an employee who had come to school early to light the boilers and managed to close fire doors after he saw smoke, saved the 1911 annex. Old Longfellow was in ruins. The following day, plans were already being made to adapt the undamaged 1911 gymnasium for classrooms for the 283 pupil, 10 teacher school. In the interim, 5th and 6th graders (by this time, junior high schools had been opened for upper grades) were sent to nearby schools, while the lower grades were given a”vacation” for a few days. A month later, architect William Stuhr of Cervin and Stuhr presented plans for a new Longfellow to the School Board. 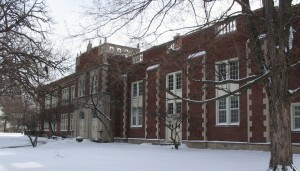 Stuhr’s new Georgian- and Tudor-inspired Longfellow was a two-story L-shaped building with 14 classrooms and a combination auditorium and gymnasium. The 1911 annex, which was reused to save money, was carefully designed to appear as a seamless part of the new building. Illinois Public Works Administration provided funding for the $169,000 depression-era project. Although Edward Hammatt’s design remains only in pictures, today’s Longfellow school is still true to the William Stuhr vision. Diamond patterns created by subtly contrasting colors of brick decorate the plain walls while the building corners have stonework quoins. Round-topped doorways beneath open pierced stone designs and finials at the roof line create a distinctive entrance. The Keystone neighborhood, always proud of its historic school, initiated a successful effort to keep the school open with a brand new addition at the back. For this they received a RIPS award in 2007. This article, by Diane Oestreich, is slightly modified from the original, which appeared in the Rock Island Argus and Moline Dispatch on August 6, 2006.